On January 14, 2016, the Regional Governing Board entered into a first year Agreement, known as Phase 1, with the Robert Young Center (RYC) to provide an organized mental health crisis system in the five (5) counties of Cedar, Clinton, Jackson, Muscatine and Scott. Crisis Interventions, responses and resolutions are a continuum of strategies and services as referenced in IAC 441-25.18(2)c. The goal of the crisis service continuum is to engage and assist individuals at an earlier stage of crisis to avoid the need for more intensive services. On January 30, 2017, the Regional Governing Board entered into a second year Agreement, known as Phase 2, with the Robert Young Center (RYC). Phase 2 will provide additional and complementary services to the organized mental health crisis system. Phase 1 of the Agreement will continue to meet the requirements of IAC 441-24.32, Crisis Screenings and Assessments and IAC 441-24.34, a 24-Hour Crisis Line. Phase 2 is a second component to Eastern Iowa Crisis System designed to increase Access, decrease Cost, and increase Quality; (ACQ). These components were derived from 146 meetings and conversations with stakeholders. 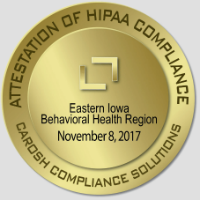 Crisis Evaluations, including crisis screening and crisis assessment, in accordance with the requirements of IAC 441-24.32, were developed under Phase 1 of the Eastern Iowa MH/DS Region Crisis System. 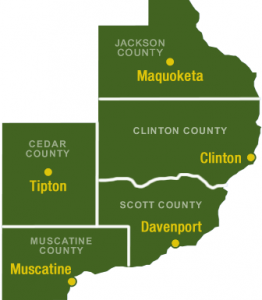 Screenings and assessments are conducted via TeleHealth or face to face in the Emergency Departments of hospitals within the Region except services within Cedar County, which are conducted by a Mobile Crisis team due to having no general hospital in Cedar County. The Regional Crisis System timeline for Phase 1 implementation: Contracts executed with Healthnet Connect were completed on 3/2/2016 to share a common goal of instantaneous communication, exchange of medical information and technology-enabled health care. TeleHealth equipment was delivered on 3/16/2016 to the entities in Clinton, Jackson, Muscatine and Scott minus Cedar due to no Emergency Department. TeleHealth (Vidyo) system trainings were completed on 3/4/2016 to the entities in Clinton, Jackson, Muscatine and Scott minus Cedar due to no Emergency Department. TeleHealth MOU’s were executed in Clinton at Mercy Medical Center on 6/16/2016; Genesis Health System-DeWitt on 5/24/2016; Jackson County Public Regional Hospital on 5/23/2016; UnityPoint Health- Muscatine on 4/13/2016; and Genesis Health System-Davenport on 5/19/2016. TeleHealth went live at UnityPoint Health-Muscatine on 4/13/2016 and Genesis Health System in Davenport on 5/19/2016. Mercy Medical Center in Clinton went live on 9/19/2016 and Genesis Health System in DeWitt on 8/26/2016. Jackson County Public Regional Hospital went live on 9/23/2016. Mobile Crisis in Cedar County went live on 7/15/2016. The 24-hour Crisis Line is managed by Foundation 2 which is a crisis center providing counseling, crisis service coordination, information and referral, linkage to services, and crisis screening. The crisis center has the capability to direct individuals who call in a severe psychiatric crisis to utilize their local Emergency Department or Foundation 2 staff can contact local law enforcement agencies to conduct a wellness check. All aspects of the Eastern Iowa Crisis System for FY18 are anticipated to decrease overall cost while increasing the quality of care and the dignity provided to those with mental illness and their families. 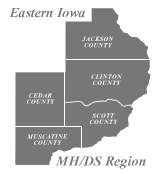 Phase 2 of the Eastern Iowa MH/DS Region Crisis System will focus on: a) mobile crisis evaluations; b) criminal justice needs of residents of Eastern Iowa MH/DS Region; c) coordinated treatment from incarceration through release; d) and community based treatment for co-occurring substance abuse and mental health throughout the continuum of services. The following recommendations of services development for Phase 2 were gleaned from the 146 stakeholder meetings held throughout the five (5) counties with behavioral health service providers, emergency medical service staff, justice system staff, law enforcement staff and local agencies. The Region’s Other Crisis Services	In addition to the Eastern Iowa Region Crisis System, there are other services already in place in the Region. The outcomes of these services are to avoid more intensive and costly services such as emergency room visits, inpatient hospitalization and intervention by law enforcement agencies. 1401 W. Centeral Park Ave.